I would like to announce my latest course – Artificial Intelligence: Reinforcement Learning in Python. This has been one of my most requested topics since I started covering deep learning. This course has been brewing in the background for months. The result: This is my most MASSIVE course yet. Usually, my courses will introduce you to a handful of new algorithms (which is a lot for people to handle already). This course covers SEVENTEEN (17!) new algorithms. This will keep you busy for a LONG time. If you’re used to supervised and unsupervised machine learning, realize this: Reinforcement Learning is a whole new ball game. There are so many new concepts to learn, and so much depth. It’s COMPLETELY different from anything you’ve seen before. That’s why we build everything slowly, from the ground up. There’s tons of new theory, but as you’ve come to expect, anytime we introduce new theory it is accompanied by full code examples. What is Reinforcement Learning? It’s the technology behind self-driving cars, AlphaGo, video game-playing programs, and more. You’ll learn that while deep learning has been very useful for tasks like driving and playing Go, it’s in fact just a small part of the picture. Reinforcement Learning provides the framework that allows deep learning to be useful. Without reinforcement learning, all we have is a basic (albeit very accurate) labeling machine. With Reinforcement Learning, you have intelligence. Reinforcement Learning has even been used to model processes in psychology and neuroscience. It’s truly the closest thing we have to “machine intelligence” and “general AI”. What are you waiting for? Sign up now!! This is part 3/3 of a series on deep belief networks. Part 1 focused on the building blocks of deep neural nets – logistic regression and gradient descent. Part 2 focused on how to use logistic regression as a building block to create neural networks, and how to train them. Part 3 will focus on answering the question: “What is a deep belief network?” and the algorithms we use to do training and prediction. This and other related topics are covered in-depth in my course, Unsupervised Deep Learning in Python. What is a deep belief network / deep neural network? It is common to use more than 1 hidden layer, and new research has been exploring different architectures than the simple “feedforward” neural network which we have been studying. Recurrent neural networks have become very popular in recent years. 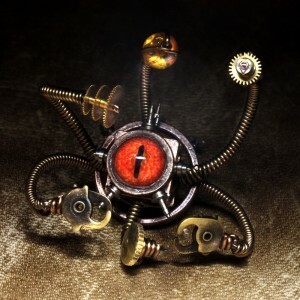 These networks contain “feedback” connections and contain a “memory” of past inputs. We will not talk about these in this post. Ok, so then how is this different than part 2? One reason deep learning has come to prominence in the past decade is due to increased computational power. It used to be that computers were just too slow to handle training large networks, especially in computer vision where each pixel of an image is an input. We have new libraries that take advantage of the GPU (graphics processing unit), which can do floating point math much faster than the CPU. Note that because the architecture of the deep belief network is exactly the same, the flow of data from input to output (i.e. prediction) is exactly the same. The only part that’s different is how the network is trained. One problem with traditional multilayer perceptrons / artificial neural networks is that backpropagation can often lead to “local minima”. This is when your “error surface” contains multiple grooves and as you perform gradient descent, you fall into a groove, but it’s not the lowest possible groove. Deep belief networks solve this problem by using an extra step called “pre-training”. Pre-training is done before backpropagation and can lead to an error rate not far from optimal. This puts us in the “neighborhood” of the final solution. Then we use backpropagation to slowly reduce the error rate from there. So what is this pre-training step and how does it work? To understand this, we first need to learn about “Restricted Boltzmann Machines” or RBMs. Going back to our original simple neural network, let’s draw out the RBM. I’ve circled it in green here. The RBM contains all the x’s, all the z’s, and the W in between. That’s pretty much all there is to it. 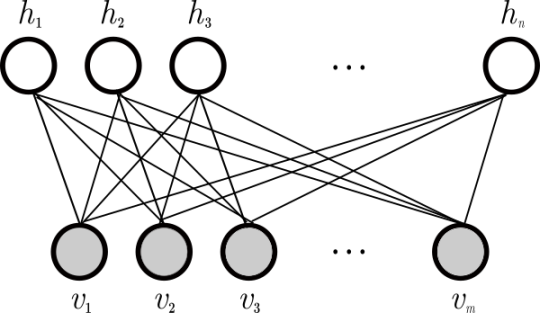 An RBM is simply two layers of a neural network and the weights between them. In an RBM we still refer to the x’s as the “input layer” and the z’s as the “hidden layer”. If you’ve ever learned about PCA, SVD, latent semantic analysis, or Hidden Markov Models – the idea of “hidden” or “latent” variables should be familiar to you. As a simple example, you might observe that the ground is wet. You could have multiple hidden or latent variables, one representing the fact that it’s raining, another representing the fact that your neighbor is watering her garden. In a sense they are the hidden causes or “base” facts that generate the observations that you measure. Since RBMs are just a “slice” of a neural network, deep neural networks can be considered to be a bunch of RBMs “stacked” together. In this section we will look more closely at what an RBM is – what variables are contained and why that makes sense – through a probabilistic model – similar to what we did for logistic regression in part 1. Although not shown explicitly, each layer of the RBM will have its own bias weights – W is the only weight shared between them. We will denote these bias weight as “a” for the visible units, and “b” for the hidden units. We’re going to rename some variables to match what they are called in most tutorials and articles on the Internet. We’ll denote the “visible” vectors (i.e. inputs) by v and index each element of v by i. We’ll denote the “hidden” units by h and index each element by j. Where Z is a normalizing constant so that the sum of all events = 1. To train the network we again want to maximize some objective function. What should that be in this case? Given that all we have are a bunch of training inputs, we simply want to maximize the joint probability of those inputs, i.e. Where V is of course the set of all training inputs. Note that we do not use any training targets – we simply want to model the input. Thus, RBM is an unsupervised learning algorithm, like the Gaussian Mixture Model, for example. The learning algorithm used to train RBMs is called “contrastive divergence”. Contrastive divergence is highly non-trivial compared to an algorithm like gradient descent, which involved just taking the derivative of the objective function. If you are going to use deep belief networks on some task, you probably do not want to reinvent the wheel. There are packages out there, such as Theano, pylearn2, and Torch7 – where a lot of people who are experts at this stuff have already written and optimized the code for performance. Learning how to use those packages will take some effort in itself – so unless you are going to do research I would recommend holding off on understanding the technical details of contrastive divergence. You still have a lot to think about – what learning rate should you choose? How many layers should your network have? How many units per layer? What about regularization and momentum? These are not easy questions to answer, and only through experience will you get a “feel” for it. This and other related topics are covered in-depth in my course, Unsupervised Deep Learning in Python. We fully derive and implement the contrastive divergence algorithm, so you can see it run yourself! We’ll also demonstrate how it helps us get around the “vanishing gradient problem”. This is part 2/3 of a series on deep learning and deep belief networks. This section will focus on artificial neural networks (ANNs) by building upon the logistic regression model we learned about last time. It’ll be a little shorter because we already built the foundation for some very important topics in part 1 – namely the objective / error function and gradient descent. We will focus on 2 main functions of ANNs – the forward pass (prediction) and backpropagation (learning). Your sci-kit learn analogues would be model.predict() and model.fit(). As with logistic regression, we have some set of training samples, X1, …, Xn, and we will use gradient descent to learn the weights of our model. We then test our model by computing predicted outputs given some test inputs (the forward pass) and comparing them to the true outputs. This topic is covered in-depth in my course, Data Science: Deep Learning in Python. We derive all the equations by hand, step-by-step, and we implement everything using Numpy and Python. To solidify the concepts, we apply the method to some real-world problems, including an e-commerce dataset and facial expression recognition. As with logistic regression, we will start with a diagram / schematic of a neural network. We call the column of x’s the “input layer”, the column of z’s the “hidden layer”, and the column of y’s the “output layer”. As in part 1, we will only use one y (binary classification) for most of the tutorial. Recall that the only difference is that when you have more than one output, you use the “softmax” output function. The methods (calculating the gradients for gradient descent) remain the same. We can combine each of the weights w(i,j) into a matrix W – this is useful for coding in languages like Python and MATLAB where matrix and vector operations are much faster than for-loops. The size of W will be N x M where N is the number of x’s and M is the number of z’s. 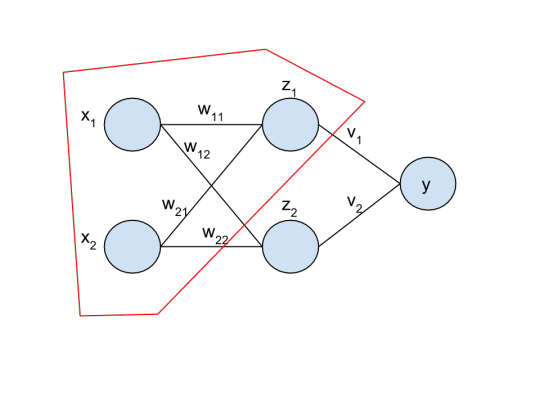 Similarly, v(j) can be combined into a vector V of size M.
If we had more than one output for y, V would be a matrix of size M x P, where P is the number of y’s. As in part 1, “sigma” refers to the sigmoid function, but other functions may be used. The hyperbolic tangent, or “tanh” is sometimes used – it is just a vertically scaled version of the sigmoid. Both make it relatively easy to compute the derivatives for gradient descent later on. 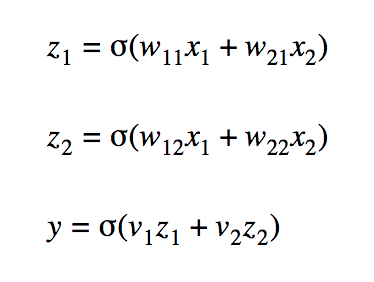 If you look at how we compute z1, z2, and y closely – you’ll recognize that these are all just the logistic regression formula. In fact, an artificial neural network is just a combination of multiple logistic regression units put together. One way we interpret this is that z1 is some “feature” extracted from (x1,x2), weighted by (w(1,1),w(1,2)), and similarly for z2. Then y is a logistic regression on (z1,z2) – the features learned from the input. This all begs the question – why use neural networks in the first place if we are just going to add a bunch of parameters and make it look more complicated? Recall that logistic regression only worked on linearly separable problems. For example, you couldn’t train a logistic regression unit to learn the XOR function because you can’t draw a line between the classes. What you could do if you really wanted to use logistic regression, is create another input x3 = x1*x2. As an exercise, convince yourself that this works. Hint: try [w0,w1,w2,w3] = [-0.5,1,1,-2]. The problem with the above approach is that you had to come up with the extra feature (x3) manually. You don’t know ahead of time what will work and what won’t. Real machine learning problems can have hundreds or thousands of inputs – you can’t try every combination possible. We haven’t even considered other functions. What about sin(x)? x^2 or x^3? log(x)? There are infinitely many features we could extract. The beauty of neural networks is that they learn these features automatically. As an exercise, try manually assigning weights to a neural network with 3 hidden units that can compute the XOR function at y. Another way of stating what we have just learned – artificial neural networks can learn nonlinear functions. Learning the weights for a neural network is very similar to logistic regression. We will follow the same method here – write out the objective function we want to minimize, calculate its derivative with respect to the parameter we want to update, and use the gradient descent algorithm to perform the weight update. 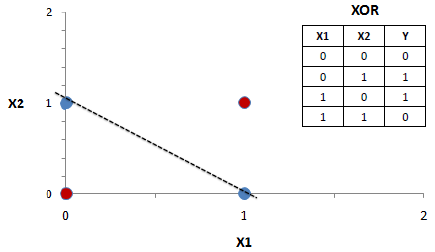 The only difference now is that the likelihood depends on W (which was 1-D for logistic regression and is now 2-D) and V – since Y depends on W and V.
Even the objective function J remains the same as with logistic regression – it only depends on the output y and the target t – and will be the squared error or cross-entropy depending on the problem. Here we’ve assumed we’re using the cross-entropy error, R is the total number of training samples and we index them by r – running out of letters! The gradient for W is a little more complicated because it involves calculating the “total derivative”. If you have more than one output y(k), k=1…P – then the objective function will depend on all the y’s. At the same time, each y(k) will depend on the same w(i,j). Note that we can expand the right-most derivative so that we take the derivative of y(k) with respect to z(j), multiplied by the derivative of z(j) with respect to w(i,j). The latter term does not depend on k, so it can be removed from the summation. Although this may seem now like a straightforward application of vector calculus – don’t be fooled – it took researchers many years to figure out how to solve this problem. Read more on Wikipedia. So far we have looked at neural networks with only one hidden layer, but neural networks can have any number of hidden layers, with any number of dimensions per layer. (You will need to apply the total derivative rule recursively for each layer going backward). You may want to do your own research as to what type of architectures will work best for your problem. Neural networks almost give us too many choices – how many layers should I have? 1? 3? 100? How many units per layer? 500? 10000? 10001? Of course, adding layers and units will only increase the time in takes to train your neural network. Every layer you add will result in an increase of N1 x N2 parameters to your model – where N1 is the number of inputs into the layer and N2 is the number of units in the layer that receives the inputs. Thus neural networks can be very prone to overfitting. Suppose we are training a network with one hidden layer, where the input is a 32 x 32 image, the hidden layer has 500 units (i.e. 500 features extracted), and the output is 10 (because the images are handwritten digits from 0 to 9). That’s 32 x 32 x 500 parameters for W, and 500 x 10 parameters for V. That’s 517 000 parameters! One “rule of thumb” I’ve seen is that you want the number of training samples to be at least 10x the number of parameters. So for the example above, you’d want at least approximately 5.2 million samples to train from. So you don’t want to needlessly add more layers and more units to your neural network just to make it more expressive.